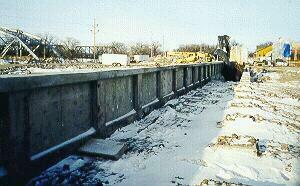 Sample section of "Invisible Flood Control Wall"
The city of East Grand Forks built a new dike and floodwall to protect the rebuilt downtown area. The two blocks closest to the river will be protected by the first U.S. installation of the "Invisible Flood Control Wall". 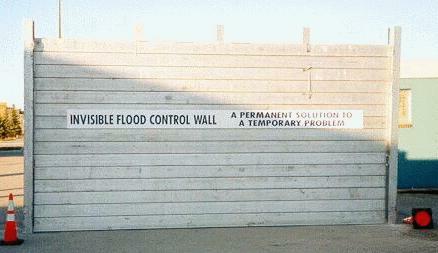 The "Invisible Flood Control Wall" is erected only when a flood threatens. The rest of the time, the river will be visible from the downtown area. 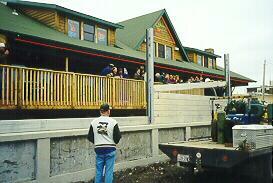 The "Invisible Flood Control Wall" is erected on a permanent concrete base. When a flood threatens, the vertical columns are inserted in holes in the concrete base, and the interlocking horizontal planks are stacked between the columns. 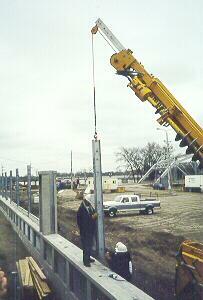 The supports are then erected behind the floodwall, resting on concrete pads. As floodwater rises against the outside of the wall, floodwater fills the hollow horizontal planks, strengthening the wall. 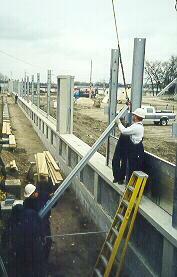 Assembling the floodwall: First the aluminum support columns are bolted to the floodwall base. The base of the "Invisible Flood Control Wall" under construction. The base will provide protection to the 100-year flood level. Next, aluminum planks are stacked between the support columns. Finally, angle braces are bolted in place behind the planks.